The Artist Dining Room, the supper club which themes meals around specific artists, is back with a Halloween dinner themed around the work of German Dada and Surrealist artist Kurt Schwitters. Take a look at the menu below - this is not your typical supper club! Tickets are £36.50, and it's BYOB. 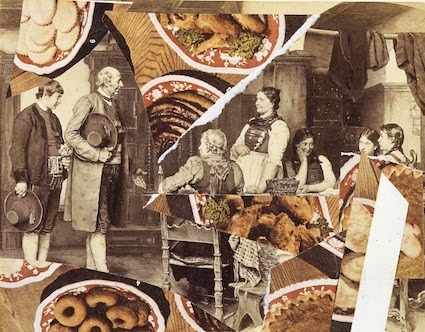 To coincide with his most inspiring month, the last Thursday in October will host The Artist Dining Room inspired by German Dada and Surrealist artist Kurt Schwitters. Embracing Schwitters' life and works throughout the evening, Guest Chef Claudia Stachelhaus of The White Room has crafted a menu offering a journey for the palate. Guest Host artist and musician Florian Kaplick will lead guests though a journey of music and performance, uncovering the world of Schwitters. Join us in celebrating a very Dada Halloween. Born in Hanover in 1887, Kurt Schwitters attended the Dresden Academy of Art and at the end of the First World War made contact with Dada groups in Europe. During his lifetime, he worked across many different art disciplines, creative traditions, art forms and media, and maintained an extraordinary output of collages, paintings, poetry, performance, audio arts, theatre, photography, sculpture, installation projects. Richard Hamilton, Sir Peter Blake, Eduardo Paolozzi, Robert Rauschenberg and others acknowledge Schwitters' influence on the development of Pop Art in the early 1960s. Schwitters' influence on the development of contemporary art, sculpture and architecture continues to be widely acknowledged. This event is in collaboration with Merz Barn. Ich bin Maler, ich nagle meine Bilder.